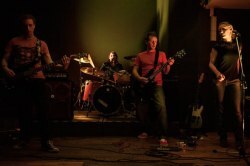 Formed in 2008 the band began playing venues up and down South Wales and even crossing borders once in a while. In 2009 the band began working with producer Paul Durrant who was to become a catalyst for a change in the bands direction and desires. Eject Pilot Eject (EPE) are a four piece rock pop band from South Wales. Fronted by a female vocalist and drummer, Sarah, EPE are visually unique. Bolstered by excellent songs, written by guitarist Owen, this is one band that really have something to sing about! Contact us for more info!